Late last month, Fantastic Beasts: The Crimes Of Grindelwald director David Yates defended casting Johnny Depp as the eponymous villain in the Harry Potter spin-off sequel despite the allegations that he physically abused ex-wife Amber Heard. Yates suggested that Depp is totally different from people like Harvey Weinstein because there weren’t “multiple accusers over many years,” and that he only sees Depp as someone who is “full of decency and kindness.” Because of that, he believes the question of whether or not Depp was abusive is a “dead issue” and he’s totally comfortable having him in the movie. Surely, though, Harry Potter creator J.K. Rowling would have something to say about Depp being in the Fantastic Beasts sequel. After all, she’s no stranger to making her feelings known when it comes to men who are assholes (allegedly or otherwise). 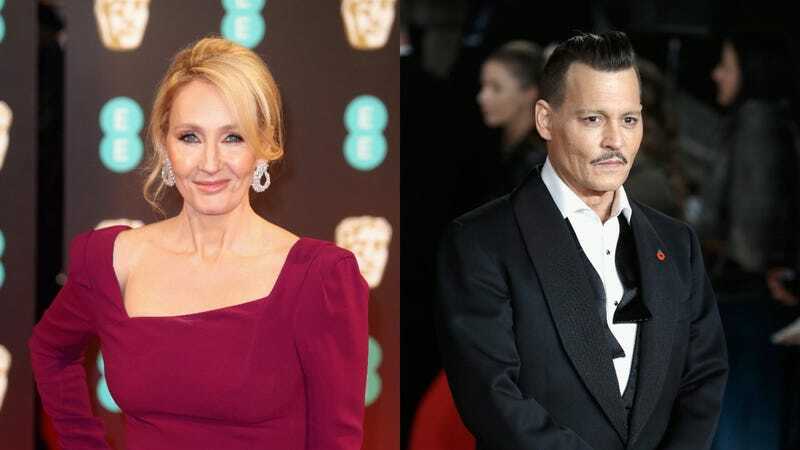 Now, finally, Rowling has offered a statement on how she feels about Depp playing Grindelwald, but anyone hoping she’d echo their misgivings about the casting will probably be disappointed to see that she’s “genuinely happy” to have Depp in the movie. Basically, Rowling is cool with it, but she says you’re free to skip the movie if you’re not.